Home > Latest News > New Logo & Website – WHY? Wow! New logo, whats that all about? Well Thorney Motorsport have been going for nearly 10 years now and during this time we’ve always had the thorns as our corporate logo so we figured it was time for a change. The thorns will always be part of our brand, hard not to have them really considering the name but you have to adapt and change with times and we wanted a sharper, more aggressive logo that would suit being on cars (race and road) more than the thorns do. We pride ourselves on developing and providing the best car tuning and motorsport parts and cars we possibly can, everything we create and supply needs to perform 100% in the harshest of environments, be those in competitive motorsport or for high performance road cars so our image and brand needs to reflect that – ultimate performance in the harshest environment. As with most things the natural environment in which we live serves as an inspiration and there are a great many animals in the World that reflect these attributes but for us the natural choice was the Thorny Devil. 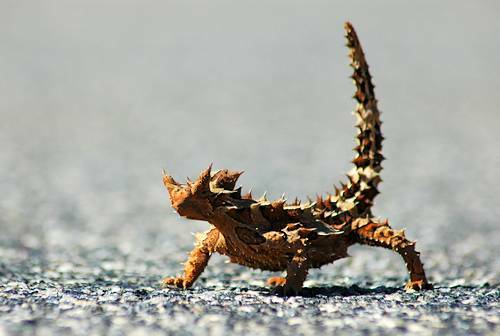 The Thorny Devil lives in one of the harshest environments in the World, the Australian outback where temperatures can reach 50 degrees in summer so to survive it needs to be tough and resourceful. He’s only small, approx 20 cm’s long, lives primarily on ants and is able to carve out an existence where most animals would die, in short he’s a tough little sod, we like him. As well as his convenient name (ok, its spelt differently but unless John is going to change his name by deed poll we’ll just have to overlook that one) the similarities in the Thorny Devils life to that of racing and road car tuning are quite apt. The environment that race cars live in is as tough and uncompromising as the Australian desert, both the devil and us need to be tough to survive the extremes in environment that we face. We like the fact that he’s small, whilst TMS is one of the UK’s largest tuning firms, running one of the UK’s largest racing operations we are still tiny compared to the factory backed race teams against which we sometimes compete, sometimes small is beautiful. The new logo is a characterisation of the Thorny Devils head. We’ll be using this new logo on all our new range of clothing, the race car livery and the new badges and wheel trims that we now have, we hope you like it!